The Chinese Web Corpus (zhTenTen) is a Chinese corpus made up of texts collected from the Internet. The corpus belongs to the TenTen corpus family which is a set of the web corpora built using the same method with a target size 10+ billion words. Sketch Engine currently provides access to TenTen corpora in more than 30 languages. Data of the last version Chinese web corpus was crawled by the SpiderLing web spider in August and November 2017 and comprised of more than 15.9 billion words. The corpus was processed with Stanford NLP Core Tools. Word sketch grammar was prepared by Ondřej Svoboda in 2017. The zhTenTen corpus was POS annotated by the Stanford Log-linear Part-Of-Speech Tagger using Chinese Penn TreeBank, see the tagset legend. The chart shows the distribution of the parts of speech in the Chinese Web corpus 2011. Kilgarriff, A., Keng, N., & Smith, S. (2015). Learning Chinese with the Sketch Engine. In Corpus Linguistics in Chinese Contexts (pp. 63-73). Palgrave Macmillan UK. Shih, M. H., & Hsieh, S. K. (2014). Sketching the Dependency Relations of Words in Chinese. ROCLING XXVI (2014), 139. 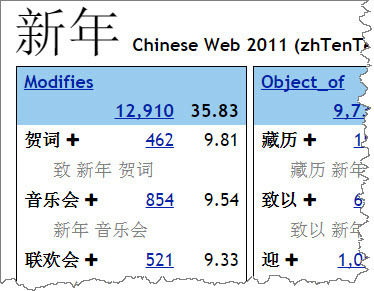 Sketch Engine offers a range of tools to work with this Chinese corpus. Sketch Engine offers 400+ language corpora in total.